Amazon S3 now supports the IPv6 protocol, so applications can connect to Amazon S3 for object storage over IPv6. You can meet IPv6 compliance requirements, more easily integrate with existing IPv6-based on-premises applications, and remove the need for expensive networking equipment to handle the address translation between IPv4 and IPv6. You can also now utilize the existing source address filtering features in IAM policies and bucket policies with IPv6 addresses, expanding your options to secure applications interacting with Amazon S3. Get started by pointing your application to Amazon S3’s new “dual stack” endpoint that supports both IPv4 and IPv6. In most cases, no further configuration is required, because most network clients will prefer IPv6 addresses by default. Applications may continue to access data through the existing APIs and virtual hosted style (e.g. http://bucket.s3.dualstack.aws-region.amazonaws.com) or path style (e.g. http://s3.dualstack.aws-region.amazonaws.com/bucket) URLs without code changes. However, you should evaluate your bucket and Identity and Access Management (IAM) policies to ensure you have the appropriate access configured for your new IPv6 addresses. IPv6 support is available for all Amazon S3 features except: Website Hosting, Amazon S3 Transfer Acceleration and access via BitTorrent. IPv6 with Amazon S3 is available at no additional charge in AWS GovCloud and all commercial AWS Regions except China (Beijing). 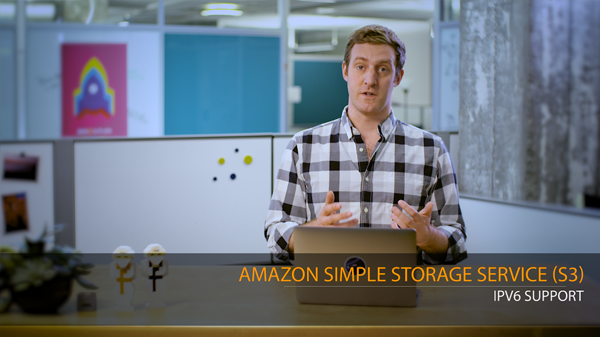 Learn more about using IPv6 with Amazon S3 in the Amazon S3 Developer Guide and the AWS Blog.